Much happened in 2014. 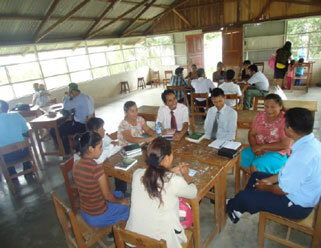 In January we held a six-week training intensive for young adults (ages 18 to 35) from the jungle. Pastor Rosendo and a variety of other pastors and missionaries kept the group busy learning and experiencing new blessings in both their personal devotional life and in personal and public evangelism. 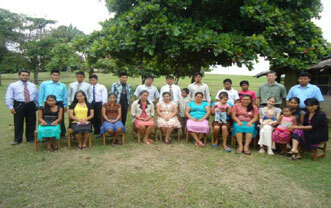 We had a total of 15 graduates from this program and 10 baptisms. The latter included the wives of two trainees and one man’s son. The remaining baptisms were from the evangelism and reaping series students held as part of their training. They are now back in their villages sharing the Good News and living as examples of God’s faithfulness and love. Immediately after this training we held a week of leadership training for leaders of all the churches in our district. It was encouraging to see young adults and more seasoned believers become excited about what they could do for their families and neighbors through Christ. Toward the end of the trainings, we were blessed to have a fun group of high school seniors from Harbert Hills Academy (Tennessee) come and help with construction of our school building as well as renovation of the chapel. It was a small group, but they accomplished much. Their class was an international group that included three students from Indonesia, two from Korea, and one from Australia. Their teacher, a friend from Outpost Centers International (OCI), and his daughter filled out the group. The group fixed the chapel’s flooring by changing out rotted, termite-eaten wood for new, stained hardwood. The students also put a lot of effort into scraping off the old paint and replacing it with new. They were able to get a good start on renovating the old school building as well, which will be our new health evangelism training center. They built two storage rooms in what will be the bakery and kitchen, and opened up a large hole in the wall between the kitchen and dining room for easier meal service. Here too they were able to install beautiful hardwood flooring after removing the remains of a softer wood that had been eaten out almost entirely by termites. During the year we spent a great deal of time dealing with the Peruvian government. We recently re-imported our Cessna aircraft and are awaiting renewal of a Peruvian operating permit, which we plan to change over to our Peruvian Association. Thankfully meanwhile, we have a flight permit to continue flying. We have also done a lot more work on our runway, widening a few areas in preparation of formally authorizing it as a private runway. We are very grateful to our new friend Earl, who has spent a lot of time working with Chris to create an AutoCAD drawing of the runway here on the base. Our learning curve has been steep and difficult as we take legal steps to import a tractor and a supplies container. We pray that we will soon be able to get this shipment through. Much will be done with the supplies in that container. We have two groups in North America awaiting our call announcing the container has arrived so they can come down and begin construction of dormitories and other structures on our new campus. This year four Colombian missionaries from Vida Sana - REdenSion (Spanish for “redemption,” God’s act of salvation) joined our new health team. They are working hard to get this new program started. We are excited, as we are already receiving queries about classes from potential students and from local churches about when cooking classes and health seminars will begin. As part of the preparation process, staff members have planted a very nice garden and mini plantation. There are tomatoes, carrots, corn, squash, peanuts, radishes, lettuce, cabbage, cucumbers, watermelon, papaya, four varieties of bananas, manioc, and more. Our garden/plantation will serve not only as a food source and teaching aid, but by God’s grace it also will be a model for local farmers to see what they can do to improve their variety of crops, quality of produce, and quantity of their harvests.